The September, 2007 Technical Bulletin, dealing with digital affiliate selection anomalies, generated a tremendous response from our readers. 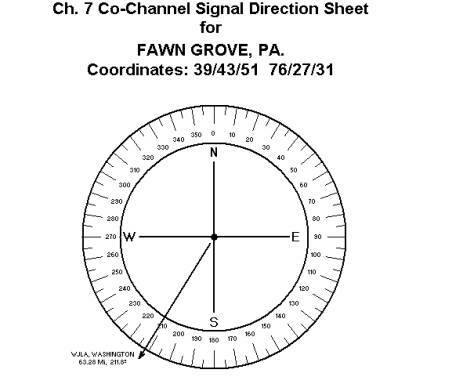 Many fellow engineers wanted to obtain more information, particularly about problematic VHF channel selections. It is not an art, but a computer-aided process. 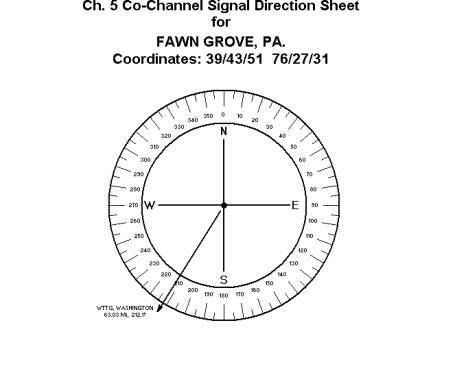 The channel by channel probing, using Biro Engineering's sophisticated, computer-generated Signal Direction Sheets may look tedious, but the results are rewarding. 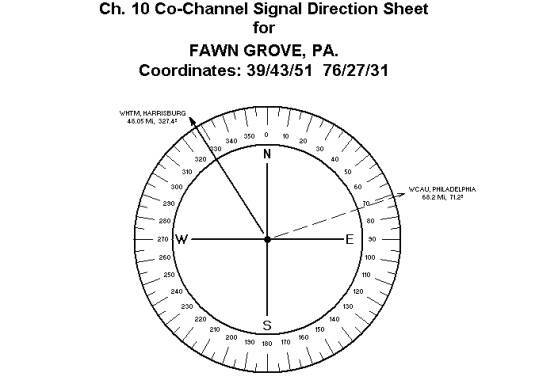 The following sample, developed for the FAWN GROVE, Pa antenna site, presents the process in great details. The objective: To find a channel allocation which is free of co-channel interference difficulties. 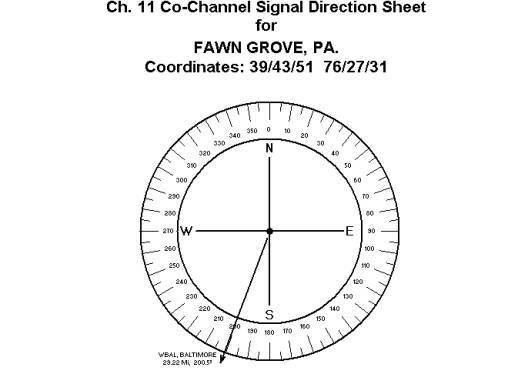 When the search displays offenders less than 65 miles from the antenna site, the desired station’s picture quality may be affected under inclement weather conditions. That channel should be avoided. There are no minimum distance specifications. Just too many factors can affect the results, such as output power, relative angle of the offending station, terrain, wave propagation conditions, etc. The minimum distance of 125 miles and greater than 35 degree relative angle are considered as reasonable guidelines. 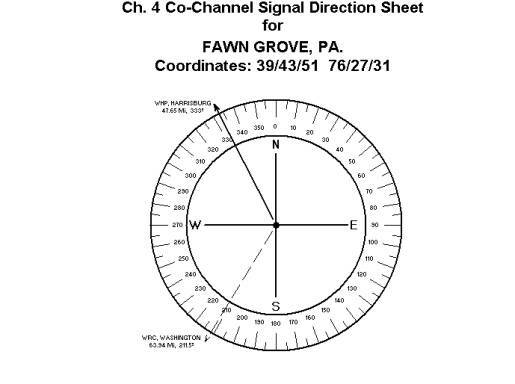 Follow the channel by channel search process as the entire VHF band is investigated, starting with Channel 4, our reference channel. 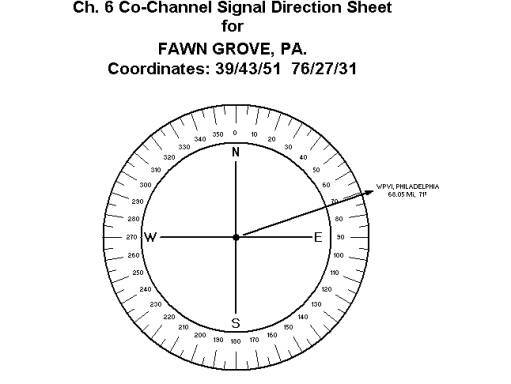 This is our reference Signal Direction sheet, displaying current Harrisburg DTV reception conditions. The Washington, DC. 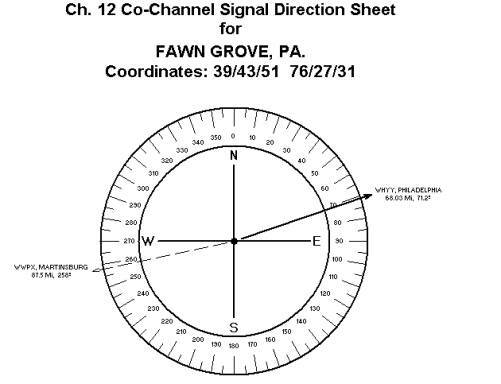 Channel 4 is not much further than Harrisburg and its output power is nine times higher than the desired station’s.. Channel 4 is not recommended to serve as Channel 21, Harrisburg’s digital affiliate. 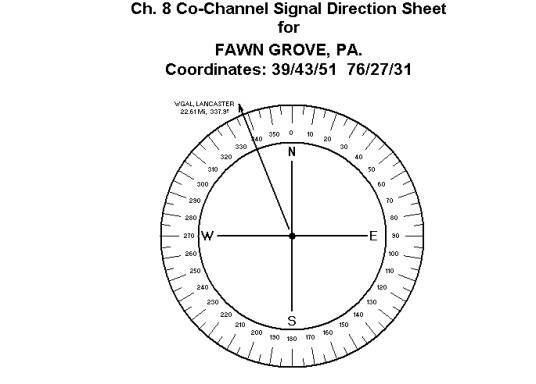 Channel 2 would be a poor selection, due to the 29.22 Mi distance. Channel 2 is not recommended. The Channel 3 selection would provide no significant advantage over Channel 4, due to the less than 70 miles distance and high output power. Channel 3 is not recommended. A carbon copy of the current Channel 4 interference conditions. Channel 5 is not recommended. Same unsatisfactory conditions as found on Channel 3. Channel 6 is not recommended. No improvement over Channel 4 when switching to Channel 7. Channel 7 is not recommended. 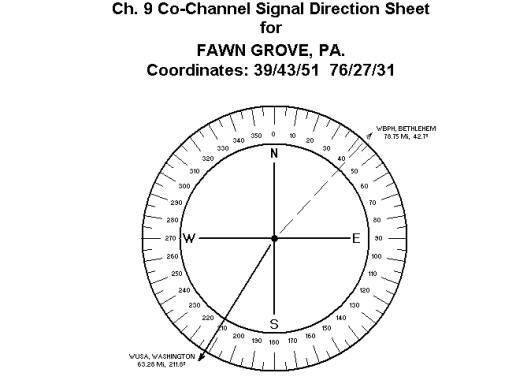 Channel 8 represents worst case conditions, due to the extremely close distance, and the less than 35° relative angle. Channel 8 is an absolute no-no. Similar situation to Channel 7, and aggravated by Channel 9, WBPH-DT from Bethlehem. Channel 9 cannot be applied. Channel 10 has been already designated to serve Channel 27, WHTM-DT, Harrisburg. 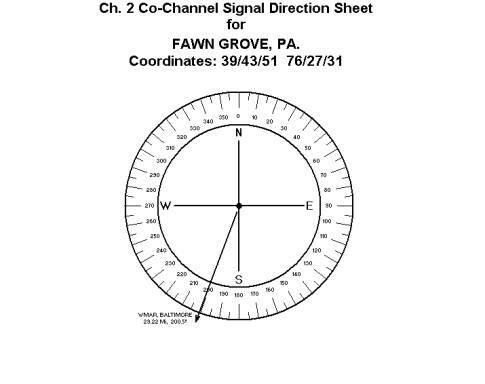 With a distance of only 29.22 Mi, the use of Channel 11 is impractical. Channel 11 is not recommended. Similar interference conditions as detected for Channel 3 and Channel 6, and further aggravated by the interference from Channel 12, WWPX-DT, Martinsburg. A carbon copy of the Channel 11 interference conditions. Channel 13 is not acceptable. None of the tested VHF channels were found acceptable. 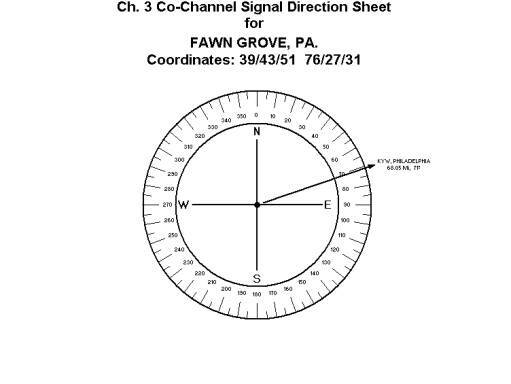 The search continued in the UHF band. The first channel delivering positive results was Channel 18. 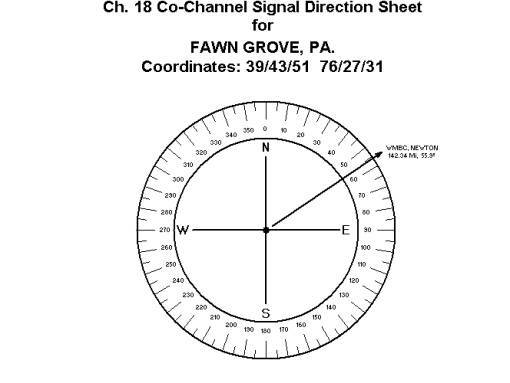 The distance greater than 140 miles distance on UHF excludes the possibility of co-channel interference. Channel 18 would be our first choice. 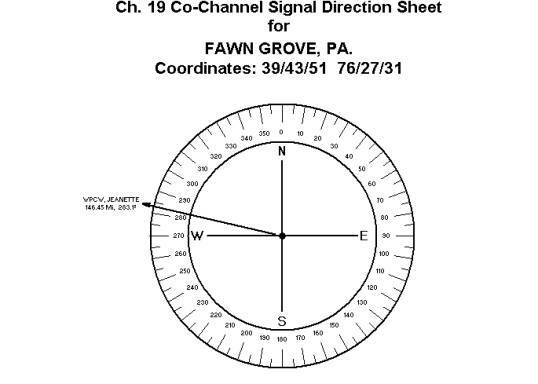 No UHF co-channel interference within 140 miles. Channel 19 would be our second choice. UHF TV stations have a tendency to request adjacent channel allocations for their digital affiliate operations. It has the significant advantage that they don't have to install a second, criminally expensive transmit antenna plus a requirement to conduct a new stress analysis on the heavily loaded tower. The current transmit antenna could be tuned to a wider, two-channel coverage. 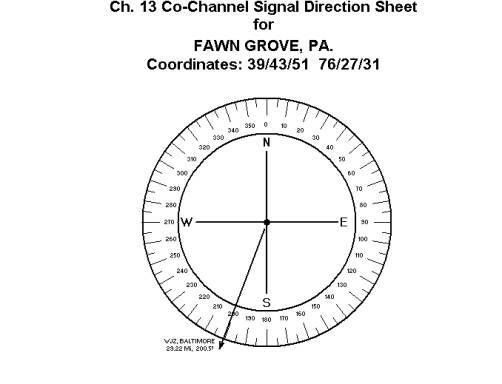 Analyzing the case of CH 21, the Harrisburg co-channel signal direction sheets delivered the following information. 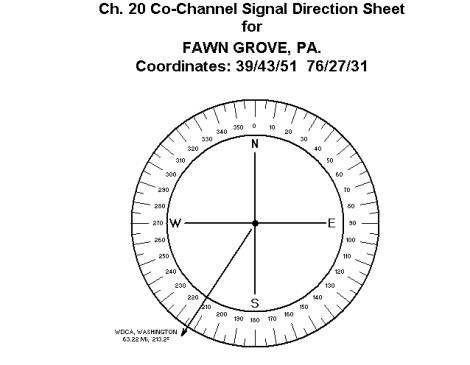 Channel 20, Washington, D.C., less than 70 miles from the antenna-site, may cause interference. This channel is not recommended. 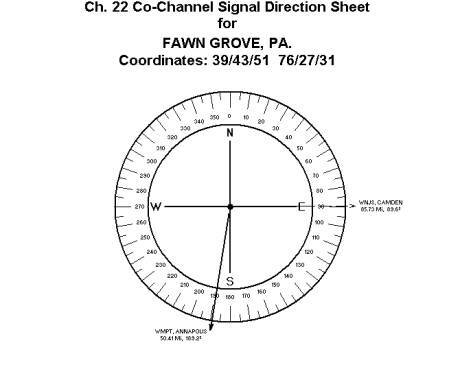 The Channel 20, Annapolis co-channel interference is too close to the site, the selection of Channel 22 is not recommended. The above analysis clearly demonstrated that the strongly desired adjacent channel selection by the station would be a poor choice, resulting in less than acceptable picture quality in the station’s greater service areas. When prominent Congressmen, like Rep. John Dingell and Edward Markey expressed their concern about the February 2009 digital conversion, they were probably not even aware of the technical difficulties associated with the poor digital affiliate channel selections. They were worried only about the 20 million American households without cable. Add the Cable TV systems’ technical difficulties with the reception of underpowered and improperly selected DTV stations in the VHF band, and suddenly the digital future looks less and less attractive. Should this Technical Bulletin reach the desk of broadcasting executives, they must realize that the Cable TV system’s difficulties with DTV reception will result in a reduction of their service area (footprint). In some cases the reduction would be severe.